Please take a moment to inventory your Voxel8 Developer's Kit Printer box contents to ensure that you have all the items listed below. NOTE: Before you start setting up and printing, you may want to examine the Developer's Kit Printer schematic for terminology on all its different parts. * Voxel8 has changed its pricing tiers. Depending on tier of purchase, the amount of PLA and Silver Barrel Syringes varies. See the store for more details. Existing pre-orders will receive more materials due to purchasing before tier changes instituted in Q3 2016. 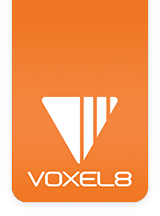 If anything is missing or damaged, please contact Voxel8 Customer Support for a replacement.